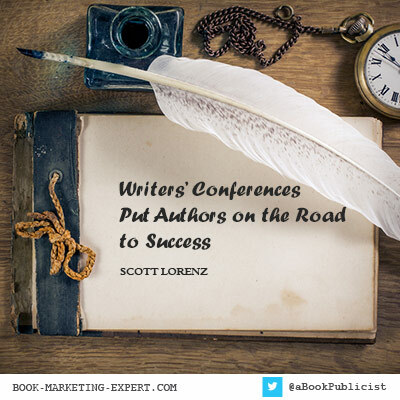 Writers’ Conferences are part of overall book marketing strategy. Attending a writers’ conference only takes a few hours, or a couple days at the most, a small investment, and a little effort to register and arrange travel and lodging, but the payoff can be big. 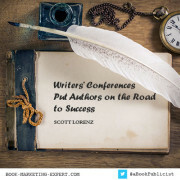 Attending a writers’ conference gives you a great chance to pitch your book, learn about the major publishing houses, meet book editors, agents and book marketing specialists. If your book is six months or a year from being finished, you can meet people who will give you valuable ideas on shaping your book and provide other advice to help you wrap up your project when you return home. Or maybe you have been working on your book for a few months and are feeling insecure or unsure whether you really can be a published author. Attending a conference is a good way to get a reality check from book editors to get a professional opinion on your plot and characters and to determine whether you are on the right track. Most importantly, attending a writers’ conference provides you with an opportunity to learn about the publishing business from fellow authors. You will also get honest and helpful professional assessments from book editors that will be more than worth the cost and effort of attending the conference. Of course, you will want to prepare for any writers’ conference you attend by having a plan of what you want to find out and what you will do while there. You will want to develop an ‘elevator pitch’ of your book that you can deliver in 30 seconds. Have a one pager available with your book cover, author headshot, short 50 word synopsis, short bio, website URL, Twitter handle and your contact information. You never know who’ll you’ll meet so be prepared for that moment. Select a writers’ conference of interest to you and be prepared to enjoy the benefits of meeting other writers, acquiring knowledge you can use immediately, learn about different genres, find a new market for your book, elevate your professional effectiveness, meet editors, agents and publishers, become inspired and return home energized. The Bottom Line: Make a commitment to attend at least one writers’ conference in 2015. You’ll be glad you did!